When you live in a single family home, your home is your castle and that means more room, more yard space and more potential. As long as you follow the neighborhood and subdivision regulations and ordinances, you can do with it as you wish. People love owning a detached house in Bucks because this is a space that is completely their own and it can be modified and improved to fit changing needs and fancies. You're in control! If you're running out of room with a growing family, there is no need to move; you have the power to build an addition to the house, as long as you follow the rules and regulations. And with houses in Bucks County appreciating much faster than townhomes or condos, it's a wise financial decision. 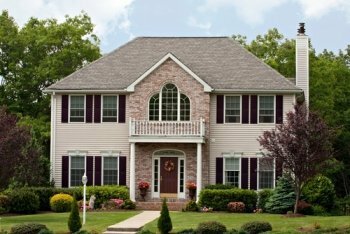 Read more about Bucks County houses below, including various architectural styles and areas where you mind find each type of house, and Register to be able to customize your search for single-family homes in Bucks County! Contact Russell Volk if you'd like to learn more about sthe current houses for sale in Bucks County or to arrange a tour of a specific community. Russell can also send you details about homes that match your exact search criteria as soon as they hit the market. This way you'll stay one step ahead of other buyers. Bucks County Pennsylvania is an area steeped in American history, and the architecture is no different, with some single-family homes being over 200 years old. Many of these heritage pieces have been lovingly restored, but many still are in need of a little TLC - perfect for any handy person with an eye for history and a good deal. Houses for sale in these styles include small stone and log cottages, all the way up to grand Georgian mansions. And, between these two, buyers can also find wood frame and clapboard farm houses. In almost all cases the homes will occupy a place of prestige in their respective areas. In this range, prepare yourself for large, authentic stone hearths, exposed beam ceilings, hardwood floors, and heritage features overflowing with old-world charm. Buyers looking for something different should also keep an eye out for the odd converted barn, for the ultimate in neo-rustic, open-concept luxury. But a piece of American history isn't the only thing on offer in Bucks County PA. The area also hosts a range of single-family home styles covering a broad spectrum of trends extending right through the 20th century and beyond. Bucks County's turn-of-the-century homes begin to show the developing wealth and sophistication of a settled, growing populace. Large porches, interior moldings, and ornamental details start to come through in Victorian, Queen Anne, and folk-Gothic styles. Single-family homes of this type tend to be a little larger than their historic forebears, reaching sizes of 1500 square feet and up. The post-war years saw a boom in the construction of smaller homes for working class families. These minimal-traditional dwellings showcased styles like Cape Cod, Craftsman-style bungalows, and the first inklings of early-modern architecture. On green lawns in Pennsylvania's growing suburbs, these comfortable homes boast modern amenities in convenient locations. At the same time, the luxury home market in Bucks County saw its own developments. Various revival styles in either the Colonial or Tudor traditions sprang up, often on large lots that today have developed into leafy oases of quiet and seclusion. Mid to late-century homes in Bucks County showed a strong preference for low, strong lines and multi-leveled layouts. At the upper end of the market, sprawling ranchers inspired by the modern Prairie aesthetic begin to make a strong showing, while on the more modest side, bi or split-level garrison homes began to populate the small-towns and suburbs. New constructions in Bucks County have since tried to capture some of the area's storied heritage, with a return to traditional Georgian, Colonial, farmhouse, and continental styles. Homes in this new-traditional idiom are often large, ranging from 2000 to over 4000 square feet. Exteriors display a mix of stately colonial facades in brick and stone, with wood frame and clapboard masses projected under multiple forward-facing gables. Overall, various common details can be found throughout new construction homes in Bucks County. These include: exterior shutters, 6-on-6 sash windows, prominently covered entryways or large porches, complex roof-lines, and large garages. "New" constructions and developments from the 1980s to 90s also included a French-Italian eclectic style that made use of steeply pitched roofs, face brick exteriors, stone arches, quoins, white center voussoirs, and a Palladian window or two. Doylestown - Here is where you will find most of Bucks County's newer developments. Buyers are snapping up these luxurious homes with large yards and more than 3,000 square feet of floor space. Warminster - The minimal-traditional split-level is the order of the day in Warminster. These homes tend to be finished in clapboard above and either stone or brick below. Basement spaces offer excellent flex-use. New-traditional constructions in this area also tend to be more elegant and understated. Levittown - Some homes in this area exhibit strong cross-gabled or salt-box configurations. The steep, featureless roof-faces on these buildings make for easy maintenance, and soak up the sun when needed. The Prairie aesthetic also shines through here as many homes show strong horizontal lines and box-like elevations. New Hope - The homes here are a bit more stately and "old world" than elsewhere in Bucks County. French eclectic, Georgian, and neo-classical elements blend together in a variety of well-balanced, luxury homes.